There's some new money for Brooklyn Borough President Marty Markowitz, but the most dramatic thing about the latest Internal Revenue Service filing from the Forest City Ratner Companies Foundation--which last April I called shadowy because of its lack of transparency--is that the total dispensed during tax year 2007, $1.89 million, exceeds the aggregate given out during the three previous years. That's a bit misleading, however, given that the single largest gift by far, $1 million, was given to the World Trade Center Memorial, a fundraising effort led by Mayor Mike Bloomberg. The mayor has been a staunch supporter of Atlantic Yards, quietly adding $105 million to the city's initial $100 million cash pledge. 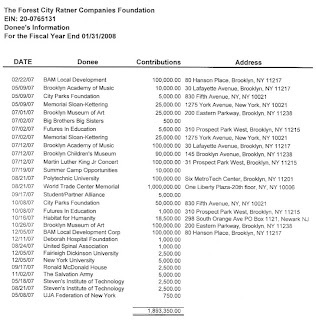 The New York Times reported 4/9/08 that Forest City Ratner's foundation has given $5 million to the $350 million raised for the memorial; the filing I examined covers the fiscal year through 1/31/08. Given that no previous FCR foundation gifts have been reported to the IRS, the additional $4 million apparently was (or was to be) delivered after the latest filing deadline. The foundation, as I wrote, has a vague, almost tautological mission: "for the charitable purpose of stimulating and encouraging charitable contributions and activities as well as directing and concentrating FCRC's own charitable activities." Corporate generosity, in this case, serves to bolster ties with charitable and nonprofit organizations in Brooklyn that, not coincidentally, can reciprocate support for FCR endeavors. For some other charities, such as Memorial Sloan-Kettering Hospital, the motivation may be simpler; Bruce Ratner's on the board. The foundation's activities are often under the radar. Its officers, as I described, are FCR executives and employees; there's no web site for grant-seekers to use, nor listed criteria for grants, nor publicly announced call for contributions. The phone number is the FCR switchboard. Nor is the list of donees described in as much detail (address, purpose) as in the IRS reports from other foundations. Also new on this year's list is $100,000 for the Martin Luther King, Jr. Concert Series sponsored by Markowitz. The web site for the concert series thanks Barclays and Forest City Ratner Companies/Nets among the sponsors, but does not single out the company's foundation. The New York Post in October pointed out that the two concert series, as well as Markowitz's Best of Brooklyn charity, have since 2003 "raked in between $680,000 and $1,00,075 from various Ratner-affiliated companies and allies." In the three previous years, the foundation had given $100,000, $100,000, and $107,035 to the Brooklyn Academy of Music (BAM). Bruce Ratner has been a BAM Trustee since 1989 and chaired its board from 1992 until 2001. BAM has unequivocally supported the Atlantic Yards project. This year the gift was $125,000. Beyond that, for the first time, the foundation gave a donation to the BAM Local Development Corporation (LDC): $200,000. The BAM LDC is part of the Downtown Brooklyn Partnership (DBP), aiming to promote a mixed-use arts district in the area around BAM. Forest City Ratner executive MaryAnne Gilmartin, the developer's point person on Atlantic Yards (and other projects), is on the DBP board. In the three previous years, donations to Polytechnic University, Forest City Ratner's neighbor and partner in building MetroTech, totaled $60,000 ($50,000 + $10,000 + 0). In the most recent filing period, the donation was $100,000. That came before Polytechnic's controversial agreement to become consolidated into New York University. Forest City Ratner has signed a letter of intent regarding development of Polytechnic's air rights. Other major donations by the foundation during the 2007 tax year included $50,000 to Memorial Sloan-Kettering Hospital (on whose board Bruce Ratner sits), $90,000 to the Brooklyn Children's Museum, and $55,000 to the City Parks Foundation (on whose board Ratner is Honorary Chair). The FCRC Foundation also gave $6600 to the Futures in Education Foundation, which supports Catholic education; Ratner's on that board, as well.